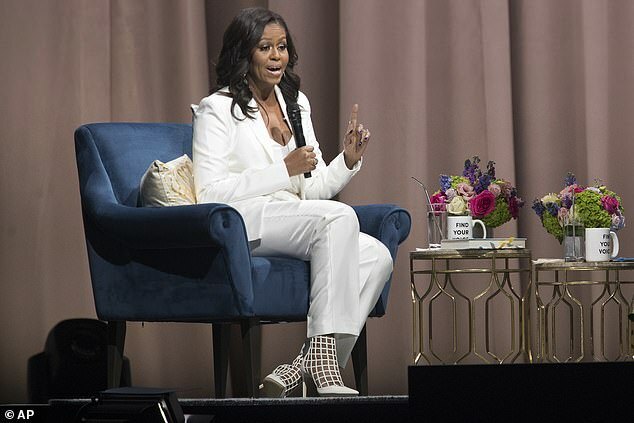 The former First Lady was commenting about whether women can experience equality in both their marriage and the workplace - ‘that whole “so you can have it all”’, as she referred to it. ‘Nope, not at the same time,’ Obama said. ‘Lean in’ is the phrase that was made popular by Facebook Chief Operating Officer Sheryl Sandberg. Sandberg’s book, Lean In, was a 2013 best-seller whose aim was to empower women in the workplace. 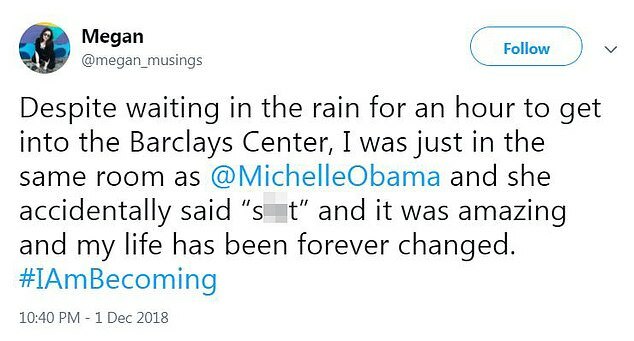 Michelle Obama’s use of the four-letter word ‘s***’ sent the crowd into a frenzy at Barclays Center, according to social media. ‘THE THOUSANDS OF PEOPLE IN BARCLAYS JUST LOST OUR COLLECTIVE S***’ tweeted Jeanna Kadlec. Its sales have outpaced those of the top two political books this year - Michael Wolff’s Fire and Fury and Bob Woodward’s Fear. When factoring in e-book and audio, Becoming has sold a total of more than 2 million copies in the United States and Canada since its November 13 release, according to the book’s publisher, Random House.